Albert Whitman & Company, 9780807556221, 32pp. "Nightlights near, nightlights far, nightlights guide you wherever you are..." At night after the sun goes down, lights come out everywhere. From fireflies in meadows to owls' eyes that catch moonlight; from lighthouses at sea to a thousand glinting city lights—follow them all on an enchanted nighttime journey that leads us home to bed. This poetic exploration of things that shine in the world—and in the sky—invites us all to see the night in wondrous new ways. 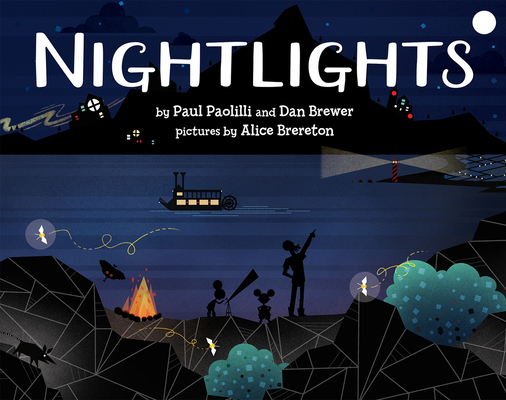 Paul Paolilli and Dan Brewer are a writing team who have collaborated on many creative projects over the years with a focus on vibrant, accessible poetry for young readers. Their first picture book, Silver Seeds, received the International Reading Association's award for Best Children's Book by first-time authors. Dan and Paul's passion to teach and learn has drawn them both into education. Paul is a retired school psychologist also living in California. Alice Brereton grew up in Minneapolis, MN, and attended the Academy of Art University. This is her first picture book.